All AE Outdoor collections are built from rust proof aluminum frames, the highest quality all-weather wickers and the most durable Sunbrella fabrics. The designs are one-of kind contemporary and made so all special moments between family and friends can be thoroughly enjoyed. All of our furniture collections are made of resin wicker and aluminum frames. Our resin wicker is made to withstand day-to-day weather including some sun, some rain, some cold and some heat. It is water-resistant, non-porous, and will not rust due to the aluminum frame. Our furniture is made to be sturdy and durable through a variety climates. Our cushions are covered in Sunbrella® fabric. Sunbrella® fabric is 100% solution dyed acrylic meaning it will not fade easily because of the Sun’s UV rays. Each fabric fiber is dyed before being woven making colors last longer. It is mold resistant and is able to endure light rains. The fabric is water resistant, not waterproof. They are still able to retain water so we recommend basic patio furniture maintenance for all of our collections. The folks at Sunbrella also do a great job providing "how to's" to care for their cushions. Click here for the latest care instructions. 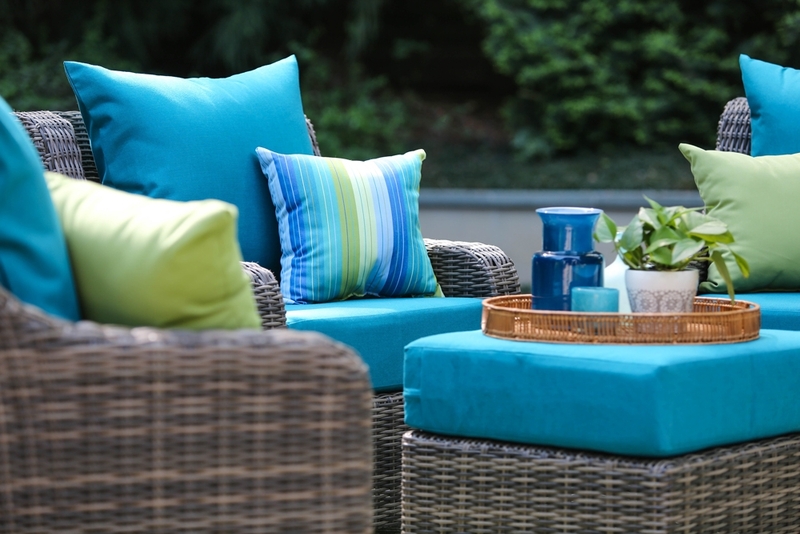 Note: Many of our set cushions are made with Sunbrella Renaissance Heritage Fabrics, a 50-50 blend of recycled and virgin Sunbrella fabric, that may contain snubs/threads of multiple colored fabrics. It's important to note that this is to be considered completely natural and expected. Read more on Sunbrella's recycled fabric efforts here. Additionally, our cushions are made from polyester foam wrapped in poly fiber batting that keeps them firm at the core with a softer outer layer. Our pillows are blow-filled with poly fibers to keep them soft and fluffy.